Find the average speed and average velocity of a particle after completion of one oscillation? While solving this problem we can understand one simple point that average velocity is the ratio of total displacement to the total time. When the body completes one complete oscillation it comes back to its original position and hence its displacement is equal to 0 therefore its average velocity is also equal to 0. Anyway while we are calculating the average as speed it is defined as the ratio of the total distance traveled to the total time taken for the journey. In the process of completing one oscillation the body completes a distance equal to 4 times of its amplitude. Therefore it will have a certain speed as shown below. Find the displacement of a body in simple harmonic motion at which the magnitude of the acceleration is equal to the magnitude of velocity? Solving this problem shall be a simple task once if you know the equations that we have derided for velocity and acceleration. 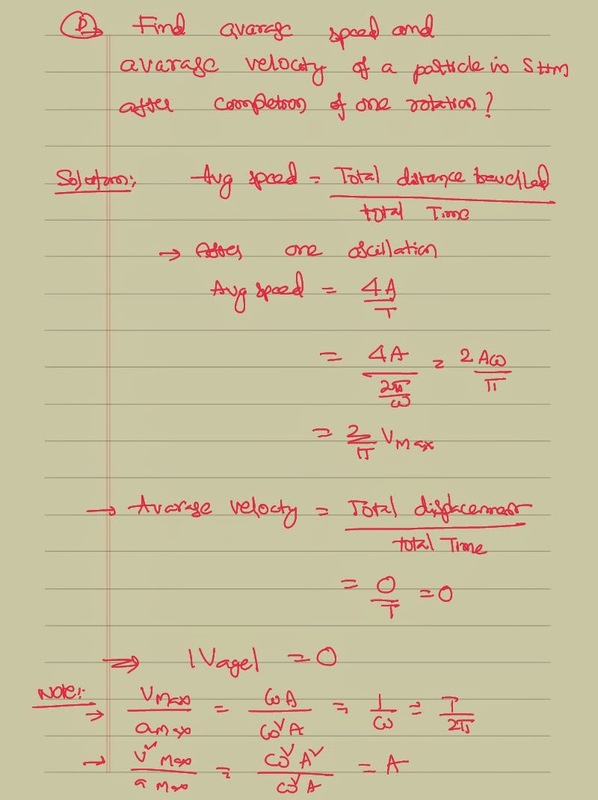 This is just substituting the numerical values of the velocity and acceleration we can get the answer as shown below. 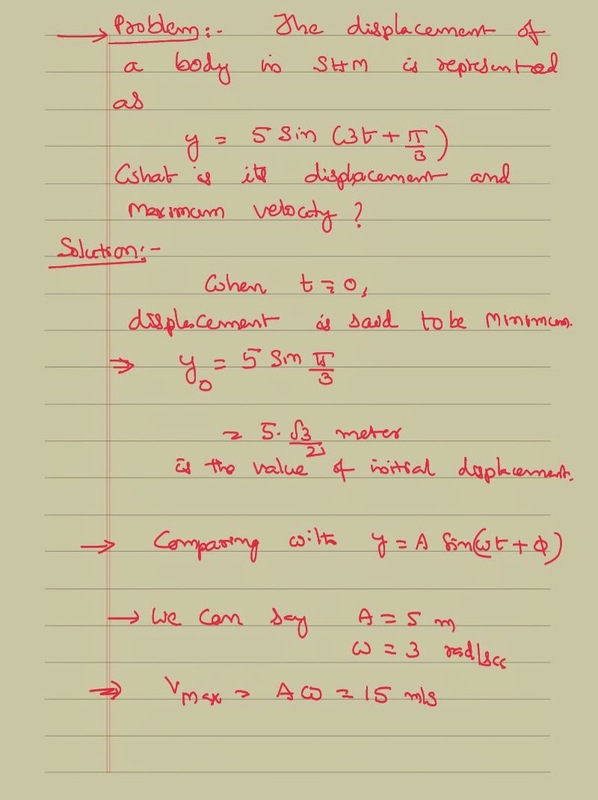 Find the displacement of a particle simple harmonic motion where velocity of the vertically is half of its maximum velocity ? 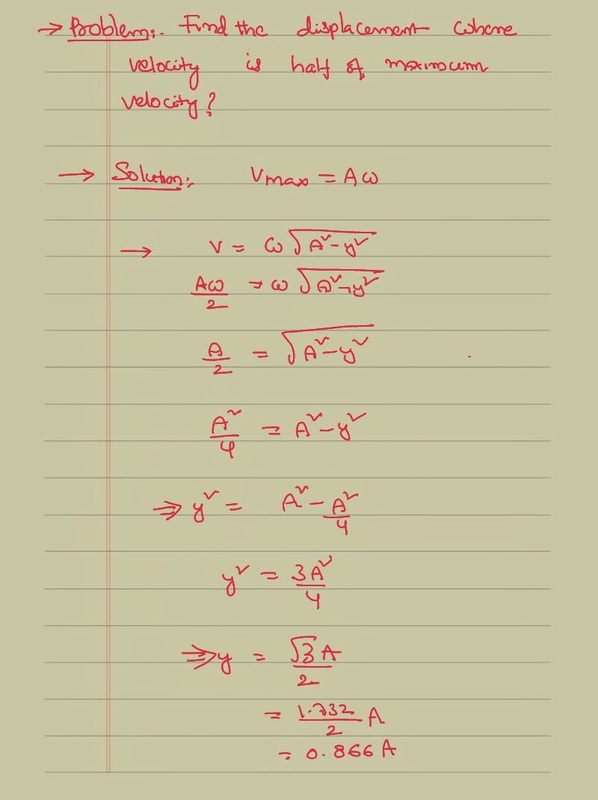 This problem also can be solved basing on the mathematical equations that we had derived for the velocity and acceleration of a body in simple harmonic motion as shown below. A graph is drawn between acceleration the displacement of a body who is an simple harmonic motion. The graph is making an angle of 45° with the y-axis as shown. Find the time period of this vibratory motion? 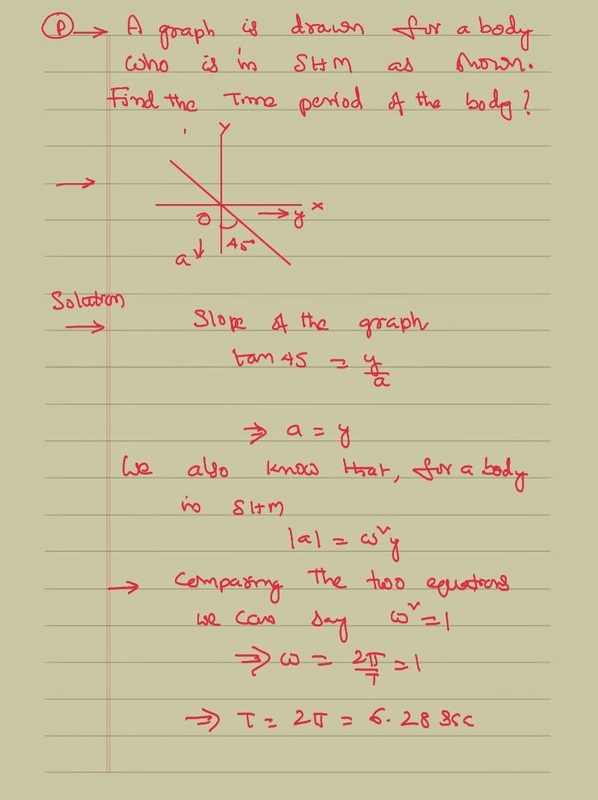 While solving this problem, we shall know a concept of slope of the graph is nothing but equal to the ratio of opposite side by adjacent side of the graph. By applying that concept we can get that slope is nothing but equal to 1. By comparing this value with the standard value of a body in simple harmonic motion we can derive the equation for the time period as shown below. The displacement of a body in a simple harmonic motion is as shown below find its initial displacement and maximum velocity of this case? In solving this problem we shall understand that a body in oscillatory motion can initially have some displacement about its mean position. This kind of the displacement is actually called initial displacement. The initial phase also helps in representing this initial displacement. 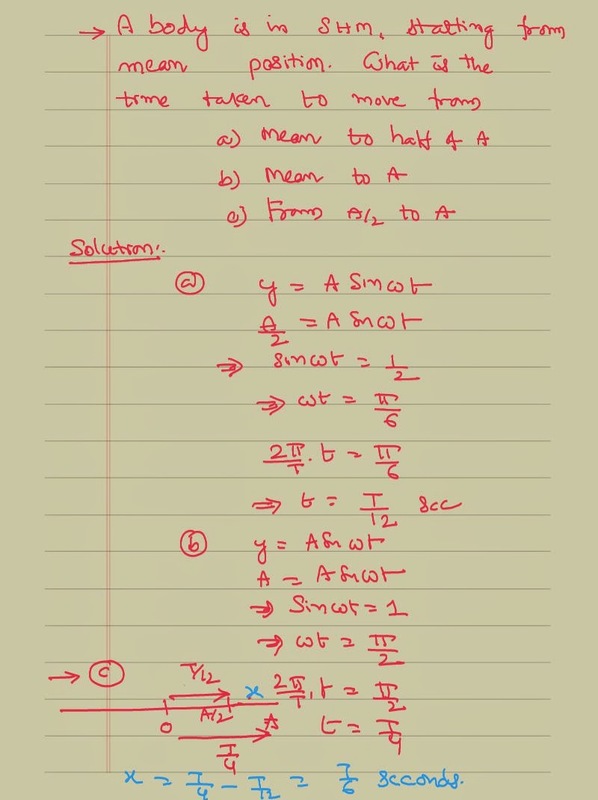 So while solving this problem we have two put time equal to 0 to get the initial displacement. 3.from half of the amplitude to complete amplitude? While solving this equation we can use the basic equation of the displacement that we had derived for a body in simple harmonic motion. 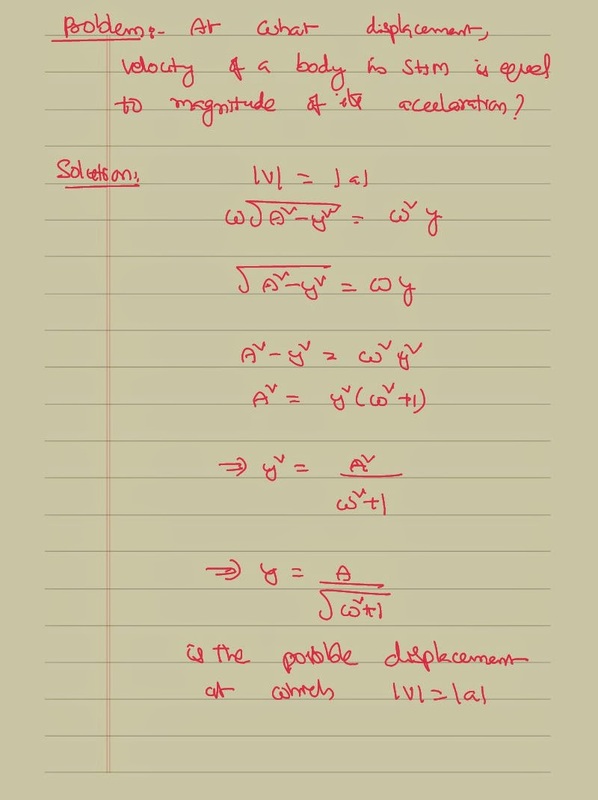 As per the demand of the problem in the place of the displacement we can write anything in terms of the amplitude as per the given data.